All three of these photos were kindly handed in by reader Yvonne Scott and feature members of her family. The first picture is of Pathhead Primary School in 1954 and in the second row with a bow in her hair is Yvonne’s mother Mary Grubb. 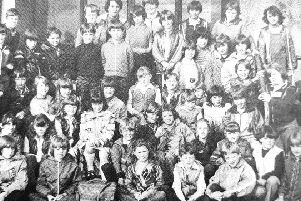 The second photo shows Yvonne’s father Alexander ‘Sandy’ Scott, back row second from the left, pictured with his classmates and teacher. And the third picture is a photograph of her grandfather in an army group photo, although Yvonne is unsure what group it is.